The magazine is free. If you have not subscribed to it go to the Lowe’s website and subscribe. They have great ideas. We decided to make less trees but make them bigger. Sweet Amanda suggested the angled branches at the top to add some interest to the corners. 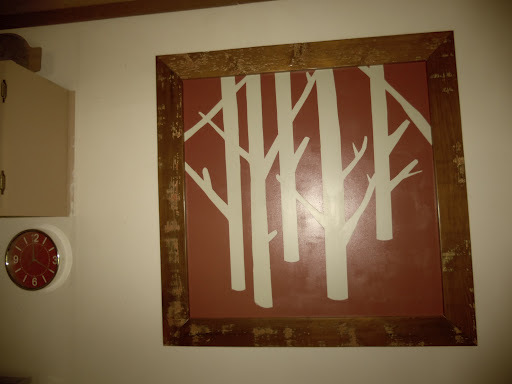 This idea was an art piece made from covering a canvas (left over hardboard for me) with a coat of paint then taping strips of tape in the shape of bare trees. Once the shapes were taped down to your liking, cover the entire board with a different color of paint. 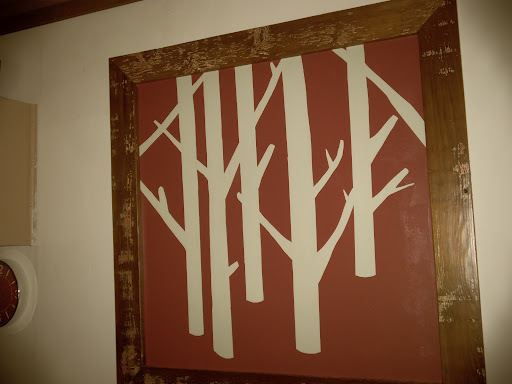 Once the top coat of paint dries, carefully peel up the tape and the tree shapes appear. Sweet Amanda and the Southern Belle were both at Star Hill along with my sister in law. I had backup. The board I had Hubby cut was really big so the first thing we decided was to cut it down to a more manageable size. Boy am I glad we did because it was huge when we finished. We had recently painted Star Hill so I had left over paint. A cool sage green that we used on the walls, a cream color we used on the trim and red used on the doors. We all decided that the sage would be the base and the red would be the top coat. Sweet Amanda helped with the taping because the Southern Belle was sick. 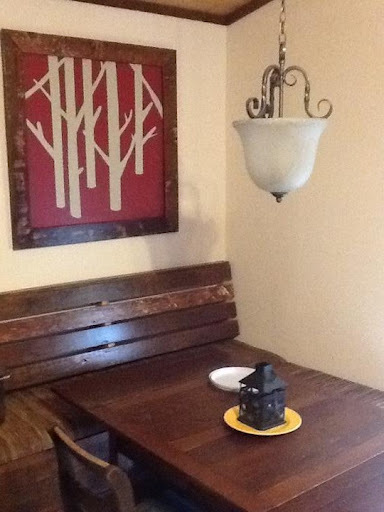 I wasn’t blogging at the time this was made but several people have asked about the picture from the dining room pictures. My advice in this project would be to run along the edges of the tape with an exacto knife lightly before peeling off the tape. I did this and my edges came out really clean. I think I might have pulled up some of the paint around the tape that I wanted to stay if I had not done that. 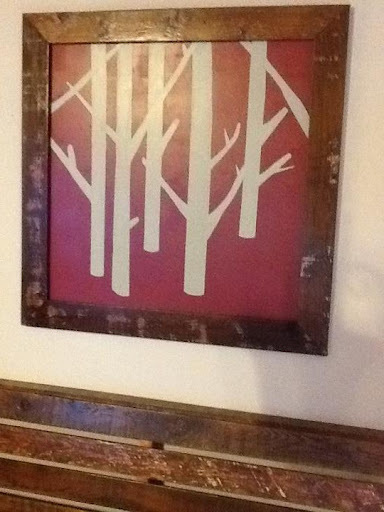 As I am sure you can tell, the frame is more of my reclaimed cedar siding with some paint showing through. The total cost for this project was zero. We did not need to buy anything for this one!